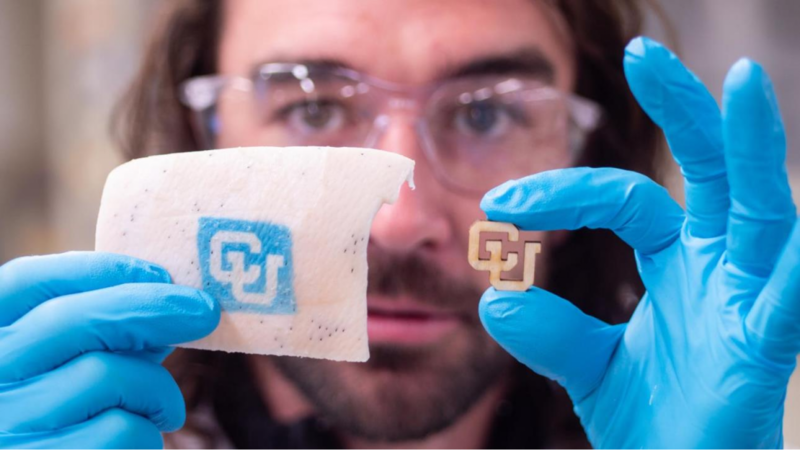 Carson Bruns, chemist of the University of Colorado Boulder’s (CU Boulder) ATLAS Institute, and graduate student Jesse Butterfield are developing a series of 'tech tattoos' that don’t just linger in the skin and look cool -they also change color in response to diverse signals. The team’s prototypes include tattoos that only appear in sunlight and colorful inks that vanish when they get hot. Scientists see tech tattoos as providing a new window to the human body - alerting people when they run a fever or allowing doctors to diagnose medical conditions without expensive blood tests. His tech tattoo project brings together outrageous colors and nanotechnology through miniature plastic beads. Carson Bruns explained that the trick to any tattoo is that it needs to last - resting in the interstitial fluid surrounding skin cells without being broken down by the body. To make smart inks that are also hardy, his team encases dyes in plastic microcapsules several times smaller than the width of a human hair. These capsules protect the dyes from wear and tear but still allow them to sense and respond to changes in the body. And such inks can be applied to the skin with the same needles used by any tattoo artist. Carson Bruns sees a lot of potential from the approach. Scientists have, for example, experimented with creating tech tattoos using commercially-available dyes that are only visible when exposed to ultraviolet rays. Such tattoos, which called 'solar freckles', could be a boon for people who roast in the sun. If a person was to put sunscreen over this tattoo, it would disappear, even in the sunlight. When sunscreen wears off, it would reappear, giving a reminder that needs to reapply your sunscreen. In the same vein, the team has developed tattoos that are turned on and off by changes in temperature - a technology that could give the body its own, built-in thermometer. The team’s approach to making tech tattoos could work with almost any kind of dye. The scientist has imagined creating tech tattoos that register blood alcohol levels - indicating when someone is too drunk to drive - or that even measure spikes and dips in blood glucose. The creations will need to undergo rigorous safety testing before they can be applied to people. But Carson Bruns already sports a tech tattoo. The scientist gave himself his own solar freckles - two blue dots on his forearm to see if it works.